These setups only apply to Opera 8 (or later). The idea is that the menu items are things rarely used. 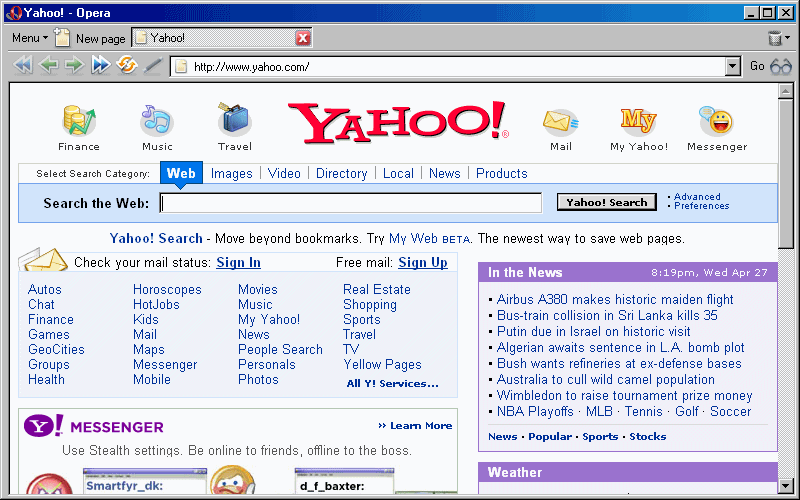 Mostly you're just surfing and using the buttons on the address bar. The View bar is great for those functions used only occassionally. A quick click of the View button on the Address bar shows/hides them all at once. The main thing missing is the status bar. While it can be useful for displaying the address of where links are going to take you, it's very simple for web sites to substitute their own status texts. You're much better off waiting for Opera's Address tooltip. The Standard Native skin bundled with Opera! Just go to Tools > Appearance > Skin and select "Windows Native". Click "OK" to accept the change. See also: Flash movie demonstration of the essential aspects of my setup. The first step is to add some custom buttons to add to the toolbars. non-troppo's Custom Buttons page is the definitive collection of custom buttons and the source of the buttons below. Click on each to add them to your "My Buttons". Click "OK" after each to close the "Customize" dialog. Menu - So I can disable the menu bar by pressing the next button for extra display space. Toggle Menu - Toggles the menu bar on/off. Used temporarily to turn the menu bar off, then removed. Refresh - Allows me to view the source of a page, make some changes, then have Opera Refresh the display to activate those changes, without re-reading the original page (and loosing my changes). Open Page in IE - Opens the current page in Internet Explorer. For testing purposes. Open Page in Firefox - Opens the current page in Firefox (must be installed separately). For testing purposes. Add to b. bookmarks - Adds the current page to my online b. bookmark collection. My PageRank button - Shows the PageRank of the current page in a popup window. b. bookmarks - Opens my online b. bookmark collection. Links like this can be dragged directly to the Start bar (the Start bar will appear when you start dragging), but obviously you'd need to modify this to point to the correct address. Temporarily create a bookmark, fix up the address, then drag from the Bookmarks panel to the Start bar. The bookmark can then be deleted. Do this now if you have a b. bookmark collection. Click the View button (the glasses) to turn on the View toolbar. 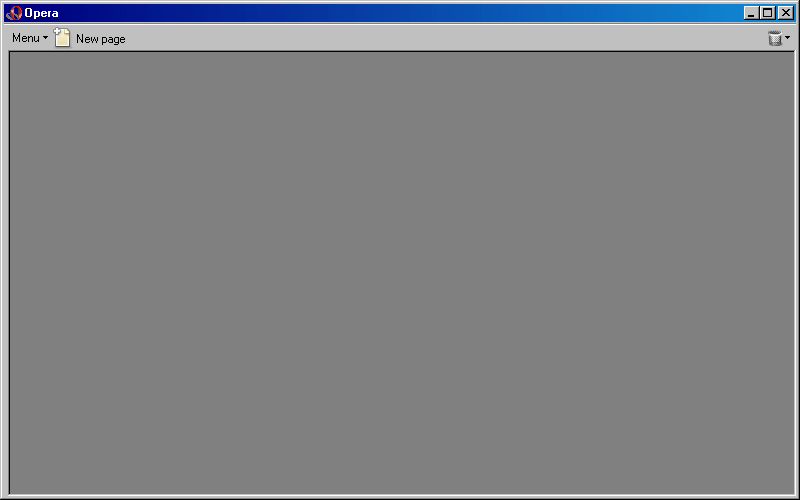 Right-click on the "Closed page" trashcan (top right) and select "Customize". Tick "Show hidden toolbars while customizing". Drag the Google search field from the Address bar to the right of Price Comparison on the Start bar. Remove Google search from the Address bar. Remove Amazon and Price Comparison from the Start bar. Tick "Navigation bar" and tick "Show only when needed". Click on the "Buttons" tab and select "My buttons". Drag the Menu button (the one with the little triangle) to the left of the "New page" button. Drag the Refresh button to the right of the Zoom selector. Drag "Add to b. bookmarks" to the left of the Zoom selector. Drag InFF and InIE to the left of "Add to b. bookmarks" (so InIE is to the left of InFF). Drag the PageRank button between the Zoom selector and the Refresh button. Select the "Browser view" category of buttons and drag the "Print preview" between "Show images" and "Fit to window width". Select the "Preferences" category and drag the "Identify as" drop-down to between "Add to b. bookmarks" and the Zoom selector. Select the "Spacers" category and drag a "Wrapper" between "Fit to window width" and "InIE". Select the "Status" category and drag a "Status field" to the left of "InIE". Click on the "Buttons" tab again, select the "My buttons" category. Drag "Menu" (the one without a little triangle) to the left of the blue rewind button. Click "OK" to accept all the changes. Click on the "Menu" to the left of the blue rewind button to turn the menu bar off, then right click on it and select "Remove from toolbar". Both the "b. bookmarks" buttons will need to be modified to refer to the correct web address of your b. installation, if you even have one. To find your toolbar INI file, see opera:about and note the "Opera directory" then look in the "toolbar" sub-folder. 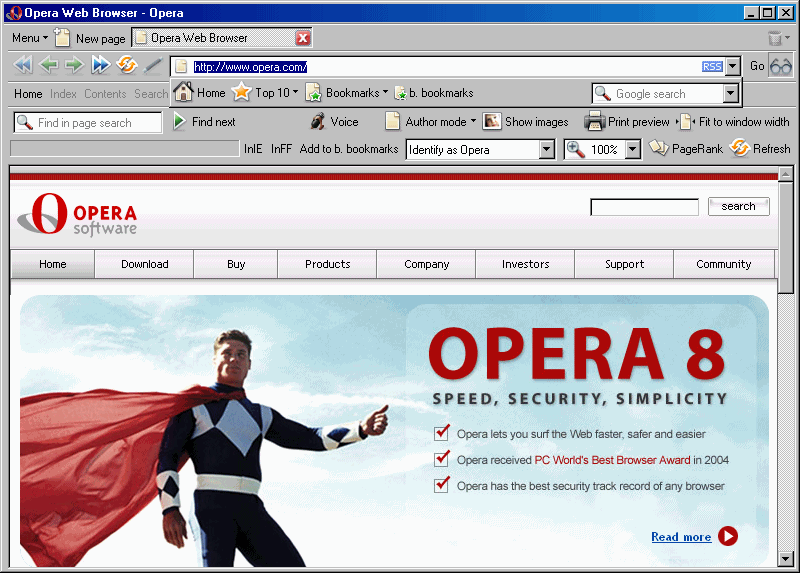 Exit Opera then edit the toolbar INI file and fix the web addresses. Last updated: 2006-01-07. Copyright © 1999-2019.